Biology of primate relaxin: A paracrine signal in early pregnancy? Relaxin is a peptide hormone that exerts numerous effects in a variety of tissues across a broad range of species. Although first identified more than 75 years ago interest in relaxin biology has waxed and waned over the years consistent with peaks and troughs of new experimental data on its wide-ranging biological effects and advances in relaxin enabling technologies. Recent insights into species-dependent differences in relaxin biology during pregnancy have once again stimulated a relative surge of interest in the study of relaxin's reproductive biology. Identification and pharmacological characterization of orphaned relaxin receptors and exploration of its paracrine effects on pregnancy using genomic and proteomic technologies have succeeded in fueling current interest in relaxin research. Primates and non-primate vertebrates exhibit very disparate profiles of relaxin genomics, proteomics and functional biology. Non-human primates appear to exhibit a very close similarity to humans with respect to relaxin reproductive biology but the similarities and subtle differences are only just beginning to be understood. We, and others, have shown that relaxin produces significant changes to the non-human primate endometrium during the peri-implantation period that are consistent with relaxin's long perceived role as a paracrine modulator of pregnancy. The purpose of this review is to summarize the reproductive biology of relaxin in non-human primates with a specific emphasis on the paracrine role of ovarian and endometrial relaxin during embryo implantation and early pregnancy. The relaxin and relaxin-like peptides have been described in a broad range of non-primate vertebrates including mouse , rat , dog , pig , wallaby , horse  and camel . Three very elegant descriptions of the molecular phylogenetics of primate relaxin can be found elsewhere [8–10]. Relaxin, relaxin-like factor (Insulin 3, INSL 3) and closely related insulin family genes are distributed on chromosomes 1, 9 and 19 in the human genome [5, 11]. To date three human relaxin genes have been identified compared to two relaxin genes in the great apes, and a single relaxin gene in old and new world monkeys [8, 12]. Two of the human relaxin genes (H1 and H2) are found at a single locus on chromosome 9 (9p24.1) whereas the H3 gene is located on chromosome 19 (19p13) [13, 14]. The great ape relaxin genes are equivalent to human H1 and H2 but the great ape equivalent of H3 has not yet been discovered. H1 and the great ape equivalents are believed to have arisen through gene duplication of H2 and its equivalent great ape gene . Chromosomal locations for non-human primate relaxin genes have not been reported. Both H1 and H2 gene products have been demonstrated in human reproductive tissues but specific pregnancy-related biological roles for these gene products have not been described . Relaxin is synthesized and secreted as a preprohormone containing a signal peptide and B-, C- and A-domains respectively arranged from N- to C-termini . Cleavage of the preprohormone signal peptide and C-domain is carried out by tissue convertases and produces the mature relaxin hormone [16, 17]. The mature hormone, arranged as an A-B domain heterodimer exhibits three disulfide bonds and opposing supportive α-helices in the A-domain. Conserved arginine residues on the B-domain that are exposed during convertase-mediated cleavage are important determinants of receptor binding . Biological activities have not been reported for the preprohormone, signal peptide or C-domain although the C-domain has been used to characterize sources and sinks for relaxin production and accumulation, respectively [18, 19]. Like other prohormones (e.g. pro-islet amyloid polypeptide, ), the primate relaxin prohormone is biologically active but the physiological significance of this ligand has not been fully elucidated [13, 21, 22]. The homology of relaxin A- and B-domains is lower and more variable amongst human and non-human primates compared to the homology of relaxin-like factor sequences [8–10]. The rank order of similarity in great ape relaxin sequences compared to H1 relaxin are Gorilla > Chimpanzee > Orangutan (A- and B-domain). Great ape A-domain sequences exhibit uniform differences compared to H2 relaxin and a rank order of similarity of Chimpanzee > Gorilla > Orangutan compared to H2 B-domain sequences . Old and new world monkey relaxins exhibit lower homology to human sequences compared to great apes, and exhibit a higher variance in B- versus A-domain homology compared with human sequences. The functional significance of the differences in relaxin sequence homology across species is not readily apparent given the demonstrable interspecies biological activity of relaxin molecules (Table 1). Despite the observed variation in sequence homology, the receptor-binding domain is a highly conserved motif consisting of two arginine residues and one isoleucine residue . Various interspecies biological effects of relaxins relevant to known physiological actions. a = native, synthetic or prohormone. cAMP = cyclic adenosine monophosphate, NHP = non-human primate. Splice variants of relaxin have been demonstrated in humans but the peptides produced by these variants have not yet been isolated and tested for biological activity . Recent evidence suggests that CT and GT dinucleotide polymorphisms in the transcriptional control regions of H1 and H2 exist, exhibit protein-DNA binding interactions that increase with repeat expansion and may support transcriptional regulation of the two genes . These studies may have implications for disorders where abnormal levels of relaxin are thought to be associated with a specific reproductive pathology (e.g. pre-term labor ). The H1 and H2 relaxin genes both exhibit zinc and mineralocorticoid response elements whereas only the H2 gene exhibits NFκβ and glucocorticoid response elements. Furthermore, the H1 and H2 genes exhibit different combinations of AP-1 and SP-1 steroid hormone and gonadotrophin dependent response sites [24–27] thus suggesting that gene expression may be regulated differently in the presence or absence of different hormones. Functional steroid hormone or gonadotrophin response sites have not yet been described for non-human primate relaxin genes. A number of studies have indicated binding sites for primate relaxin in the corpus luteum, endometrial glandular epithelium, decidua and placenta [28–32]. However, relaxin receptors (LGR7 and LGR8) remained orphaned from their peptide until very recently and have now been characterized pharmacologically in vitro . The relaxin receptors are G-protein coupled receptors with 7-transmemebrane spanning domains, a long extracellular sequence containing a series of leucine-rich repeats and an N-terminal ectodomian [33, 34]. The receptors belong to a family of glycoprotein hormone receptors including follicle stimulating and luteinizing hormones and, thyroid-stimulating hormone . Pharmacological evidence indicates that LGR7/8 can discriminate H2 and H3 relaxin with H2 and porcine relaxin being effective at both receptors whereas H3 is effective at the LGR7 receptor only [34, 35]. Relaxin exhibits greater potency and efficacy as an agonist at LGR7 compared to LGR8 [33–35]. LGR7/8 have both recently been identified in human and non-human primate endometrium [36, 37]. Some of the binding characteristics and intracellular signal transduction mechanisms involved in relaxin receptor occupancy, and other cellular mechanisms activated by relaxin are listed in Tables 1 and 2. In reproductive tissues relaxin appears to be tightly coupled to cAMP metabolism (activation of adenylate cyclase, activation of protein kinase A and inhibition of phosphodiesterase) but also exhibits cell type specific signal transduction mechanisms that involve nitric oxide, phospholipid dependent signaling and ion channel regulation [38–40]. All of these signal transduction mechanisms are consistent with the known physiology of relaxin in a broad range of cell types. The effects of relaxin on cAMP metabolism are highly relevant to its role in early implantation and pregnancy in primates (see below). The physical and pharmacological characterization of relaxin receptors in tissues of the murine, non-human primate and human female reproductive tracts represent significant advances in relaxin research and should precipitate the development of selective relaxin agonists and antagonists for use in functional studies of the specific effects of relaxin during implantation and pregnancy in primates. Binding characteristics of recombinant human relaxin at putative binding sites and intracellular signals affected. cAMP = cyclic adenosine monophosphate; CREB = cAMP response element binding protein; MAPK, mitogen-activated protein kinase; NA = data not available; VEGF = vascular endothelial growth factor. The asterisk (*) indicates that reported estimates for Kd values may be different due to tissue and radioligand differences, or both. Relaxin is produced in significant quantities in human and non-human primate ovaries during the luteal phase [24, 41]. The non-human primate corpus luteum of natural non-conceptive cycles produces relaxin that rises to a peak within approximately 14 days of ovulation and declines following demise of the corpus luteum. In pregnant cycles, rather than subsiding, relaxin secretion continues to rise during the first trimester consistent with rescue of the corpus luteum and formation of a functional placenta [42, 43]. The characteristics of relaxin secretion following ovulation in humans and some non-human primate species are listed in Table 3. Marmosets exhibit serum relaxin profiles that are clearly distinguishable from great apes, old world monkeys and rodents [, references in Table 3]. These differences could possibly be related to the distinct differences in anatomy and physiology of marmoset embryo implantation and parity compared to macaques and great apes on one hand and rodents on the other [45, 46]. However, experiments demonstrating a direct link between variations in relaxin secretion profiles in different non-human primate species and variations in the physiology of implantation and pregnancy have not been described. Characteristics of relaxin secretion in non-pregnant and pregnant cycles of humans and selected non-human primate species. Several lines of experimental evidence suggest that circulating levels of relaxin may not be suitable markers for the full biological impact of this hormone, and that local synthesis and release of relaxin may be highly relevant to its biological effects, particularly those effects related to embryo implantation and pregnancy. First, many early relaxin hormone assay systems were developed using synthetic H2-relaxin  and negligible H2 antibody cross reactivity to H1 and H3 relaxins has been demonstrated . Therefore, in many of the early studies detailing relaxin secretion, circulating levels of total relaxin may have been underestimated compared to H2. Second, circulating relaxin levels are often much lower than blood or tissue levels within specific organs . Third, circulating relaxin levels in steroid hormone supplemented patients undergoing ovum donation cycles remain below the limits of detection despite successful pregnancy . Non-human primates subjected to ovariectomy also maintain pregnancy when supplemented with steroid hormones [48, 50]. Finally, unlike some non-primate vertebrates, circulating levels of relaxin in primates are not maintained during steroid hormone supplemented pregnancy in the absence of ovaries [51–53]. Taken together these observations indicate that the primate ovary may be responsible for the majority of circulating relaxin but elevated levels of circulating relaxin may not be necessary for embryo implantation or maintenance of pregnancy in primates. The functional regulation of relaxin secretion in primates is complex and very poorly understood. Measurements of relaxin in ovarian cycles and throughout pregnancy indicate, in agreement with histological studies, that the ovary and uterus produce relaxin in a manner that is dependent upon steroid hormone and/or gonadotrophin secretion, and that pituitary-ovarian-uterine feedback mechanisms may exist [48, 54, 55]. Because the corpus luteum and preplacental endometrium are important regulators of early implantation in natural conceptive cycles the functional regulation of relaxin secretion in these tissues will be discussed but will be limited to a summary of the effects of steroid hormones and gonadotrophins. Very detailed reviews of non-human primate corpus luteum function and regulation can be found elsewhere [54, 56]. Ovarian relaxin is clearly a hormone of the luteal phase of non-conceptive cycles and early pregnancy in old world monkeys, great apes and humans (Table 3). A series of very elegant studies in rhesus macaques have demonstrated steroid hormone and gonadotrophin-mediated regulation of ovarian relaxin secretion [57–60]. The data from those studies clearly indicate that ovarian relaxin secretion very closely parallels the time-course of the rise of circulating chorionic gonadotrophin (CG), that luteal secretion of ovarian relaxin is not dependent upon progesterone (P4) or estrogen (E2) and that ovarian relaxin secretion produced by administration of exogenous human CG (hCG) is dependent upon sufficient ovarian exposure to E2 and P4 prior to hCG exposure [57, 58]. The effects of chronic hCG administration on ovarian relaxin secretion in vivo are recapitulated on chronic exposure, but not acute exposure, of luteal cells to hCG in vitro, thus suggesting a need for the continued presence of hCG to maintain ovarian relaxin secretion in primates [61, 62]. A wealth of studies in a broad range of species including primates indicate a functional interaction between steroid hormones and gonadotrophins in determination of corpus luteum function and life span [56, 63], two variables that directly effect ovarian relaxin secretion. It follows, and not surprisingly, that conceptive cycles rely on a sequential and dynamic interaction of steroid and gonadotrophin hormones to produce functional secretion of ovarian relaxin [43, 58]. A potential role for ovarian relaxin as a luteotrophic agent is suggested by experiments in rats demonstrating a relaxin-dependent increase in pituitary luteinizing hormone (LH) release but only in the presence of combined E2 and P4 priming . Studies in domestic species also indicate a potential luteotrophic action of ovarian relaxin during the early stages of pregnancy possibly mediated by enhanced secretion of P4 . 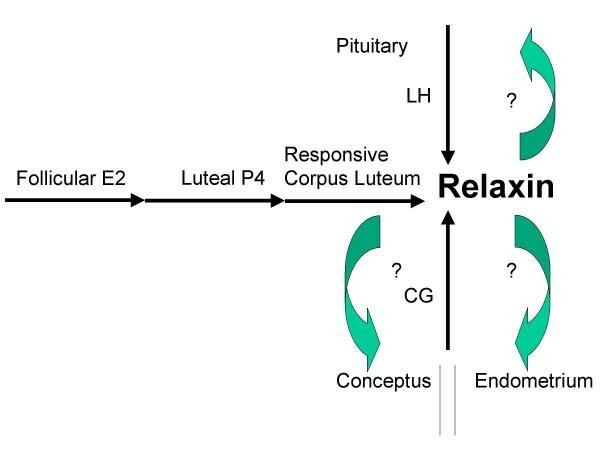 Whether or not primate relaxin produces a functional regulation of ovarian steroidogenesis, feedback regulation of pituitary gonadotrophin secretion and/or feedback regulation of uterine and conceptus gene expression during menstrual and conceptive cycles remains to be determined (Figure 1). Use of selective relaxin agonists and antagonists, or the application of relaxin ablation experiments, in primate models of corpus luteum function will be necessary to demonstrate potential autocrine/paracrine/endocrine control mechanisms for ovarian relaxin. Relaxin secretion from the primate corpus luteum Describes the sequential nature of steroid hormone priming of relaxin secretion from the primate corpus luteum and gonadotrophin influences from the pituitary and conceptus. Potential undocumented feedback mechanisms are indicated (?). LH, luteinizing hormone; CG, chorionic gonadotrophin. That ovarian relaxin is not required for successful term pregnancy in primates is suggested by several independent lines of clinical and experimental evidence indicating that pregnancies can be initiated and maintained: (i) in humans with premature ovarian failure, a sub population of infertility patients who fail to develop a corpus luteum and, presumably, ovarian relaxin , (ii) in baboons subjected to unilateral removal of the corpus luteum bearing ovary following establishment of a functional placenta , (iii) in macaques subjected to bilateral ovariectomy at embryo transfer, prior to establishment of a placenta  and (iv) in marmosets subjected to prostaglandin F2α-mediated luteolysis in mid-pregnancy . The results of these studies indicate that pregnancies can be maintained in the absence of a functional luteal phase ovary provided that steroid hormone supplementation is provided. Pregnancies subjected to the removal of the corpus luteum bearing ovary during pregnancy, after steroid production has shifted to a placental source, do not require steroid hormone supplementation. Taken together these observations clearly indicate that uterine exposure to steroid hormones, but not ovarian relaxin, is necessary and sufficient for implantation and on-going pregnancy in primates. Although ovarian relaxin appears to be unnecessary for term pregnancy in primates its potential role in proper corpus luteum function during natural cycles should not be discounted and requires further study. Ovarian relaxin is not required for pregnancy in primates but relaxin is secreted from the primate syncytiotrophoblast and glandular endometrium [41, 65] in a manner that may be up-regulated in the absence of ovaries . Then what role, if any, does embryonic/endometrial relaxin play during implantation and pregnancy in primates? Unfortunately it is not possible to answer this question directly as selective relaxin receptor agonists and antagonists have not been employed in models capable of providing an answer. Furthermore, key relaxin ablation experiments have not yet been performed in non-human primate models of pregnancy. However, it is possible to demonstrate effects of relaxin on the endometrium that are consistent with a paracrine mode of action during embryo implantation and pregnancy. Embryo-endometrial recognition, decidualization of endometrial stromal cells, embryonic vascularization and avoidance of maternal immune recognition are all very important aspects of embryo implantation and will be used as platforms for discussion of relaxin's potential paracrine actions in early pregnancy in primates. The molecular mechanisms that mediate embryo-endometrial communication in primates are incompletely understood . However, studies of embryo-endometrial communication in species where larger numbers of embryos can be created and used experimentally indicate that such a communication does exist . Embryonic and uterine expression of insulin growth factors (IGF's) and insulin growth factor binding proteins (IGFBP's) represent some of the earliest markers of implantation in primates and other mammalian species [68–70]. Studies in mice indicate that IGFBP-1 mRNA expression in uterine stromal cells and embryos cultured in isolation is static during pre-implantation embryo development in vitro but is up-regulated in stromal cells cultured in the presence of developing embryos . Up-regulation of IGFBP mRNA expression in mouse embryos exposed to human endometrial stromal cells and relaxin has been demonstrated . IGF's are secreted from the endometrium and differentially effect expression of IGF receptors and IGFBP's in preimplantation bovine embryos in vitro . In primates IGFBP mRNA is expressed in embryos at all stages of preimplantation development but increases sharply at the blastocysts stage and coincides with embryonic implantation competence [72, 73]. Taken together these studies indicate that embryo-endometrial communication takes place prior to full implantation competence, and that soluble factors secreted by both the embryo and endometrium can alter gene expression in their counterpart . Marmoset embryos cultured in vitro secrete a substance into culture medium, prior to the appearance of detectable CG and implantation competence, which reduces platelet number and aggregation in vivo [75, 76]. Relaxin suppresses the release of platelets from megakaryocytes and reduces platelet aggregation in vivo and in vitro . Given that relaxin receptors are expressed in the primate endometrium during the peri-implantation period it is tempting to speculate that embryonic relaxin could function as a paracrine signal of implantation before embryo-endometrial attachment takes place. However, to our knowledge, studies detailing the expression and functional regulation of relaxin genes in primate embryos have not been reported. The presence of relaxin gene transcripts in the primate endometrium prior to embryo implantation [15, 65] indicates that endometrial relaxin genes could also be targets for embryonic signaling factors during the peri-implantation period. Rabbit blastocysts induce endometrial secretion of relaxin prior to implantation and the secretion is maintained by the conceptus throughout the remainder of gestation . The factor(s) that mediate blastocyst initiation of endometrial relaxin secretion in the rabbit have not been identified. Again, to our knowledge, similar studies detailing blastocyst-mediated regulation of endometrial relaxin secretion in primates have not been reported. Chorionic gonadotrophin is a primate specific embryonic signal of early implantation [76, 79] that produces a significant up-regulation of relaxin secretion in the primate ovary , and therefore could potentially regulate endometrial relaxin secretion in primates. However, to our knowledge, studies demonstrating CG-mediated regulation of endometrial relaxin secretion in primates have also not been reported. Further investigations of primate embryonic factors that modulate uterine relaxin secretion and uterine signals that regulate embryonic relaxin gene expression will be important to the field of relaxin reproductive biology. As mentioned above, CG, like IGFBP-1, is one of the earliest embryonic signals secreted during the peri-implantation period and produces profound changes in the secretory nature of both the corpus luteum and the endometrium [56, 80, 81]. Plaque formation at the site of embryo apposition and attachment and decidualization of maternal endometrial stromal cells are driven by CG and its down stream effectors, and represent two very important events in early pregnancy . Some of the CG-dependent endometrial signals required for plaque formation and decidualization have been demonstrated using very elegant in vitro and in vivo models of early implantation in the baboon [82–84]. When CG is administered to ovariectomized baboons treated with E2 and P4 in a manner designed to mimic a natural cycle the CG-mediated decidualization reaction is found throughout the entire endometrium . In contrast, in vivo in the presence of a conceptus, the plaque formation and decidualization reactions are restricted to the site of embryo attachment [84, 85]. Therefore, it appears that the CG-mediated plaque formation and decidualization responses in primates are specific conceptus-driven signals, and that paracrine factors associated with this response may be responsible for limitation of the reaction to specific areas despite high circulating levels of CG . Although CG is a primate specific signal of implantation studies of embryo attachment in rabbits have also demonstrated a conceptus-mediated restriction of implantation events to areas where direct embryo-endometrial cell-cell contact occurs . Furthermore, in the rabbit model, conceptus-driven endometrial relaxin secretion is also restricted to implantation sites  thus suggesting a local paracrine effect of relaxin at the site of embryo attachment and implantation. The effects of CG on decidualization of primate endometrial stromal cells are enhanced by the presence of steroid hormones and relaxin [83, 87, 88]. It is also clear from studies in humans and the baboon that steroid hormones are necessary and sufficient to elicit decidualization of endometrial stromal cells whereas relaxin, in the absence of steroid hormones, is not sufficient for the complete decidualization reaction to occur [88–90]. Detailed studies of relaxin transcripts in human endometrium in pregnant and non-pregnant cycles clearly indicated that relaxin expression preceded the expression of IGFBP-1 and prolactin , two classical markers of decidualization , and strongly suggest a non-redundant paracrine role for primate relaxin during the peri-implantation period. Further studies detailing potential links between CG and endometrial relaxin secretion in non-human primate models are needed. Experimental observations indicate that in the presence of adequate steroid hormone priming the decidualization of endometrial stromal cells is heavily regulated by cAMP-dependent mechanisms [72, 90, 93, 94]. In rodents non-conceptus mediated decidualization stimuli produce increases in cellular cAMP content through activation of adenylate cyclase, which in turn modifies its own microenvironment so as to remain impervious to inhibitory influences . Conversely, inhibition of adenylate cyclase reduces cAMP production and prevents adequate decidualization of rat stromal cells in vitro . In humans accumulation of cAMP within endometrial biopsies is greater during the luteal phase compared to the follicular phase . Levels of cAMP required for decidualization of primate endometrial cells may be maintained in the absence of classic regulators of adenylate cyclase (e.g. LH/hCG) if gonadotrophin-induced paracrine effectors have been activated and appropriate steroid hormone exposure is maintained [81, 98]. Interlukin-1β, prostaglandin E2 and relaxin are just a few representatives of a large group of paracrine signals that modulate cAMP signaling in the primate endometrium [79, 98, 99]. In an in vitro setting baboon and human endometrial cells undergo decidualization in the presence of E2 and P4 and this reaction is enhanced by the addition of relaxin . The intracellular signaling mechanism(s) responsible for relaxin-mediated enhancement of the decidualization process appear to be cAMP-dependent. Transfected cells expressing the relaxin receptors LGR7/8 respond to porcine relaxin by producing large increases in intracellular cAMP. The same responses are not observed in the presence of relaxin related peptides such as insulin [35, 101]. Relaxin also stimulates cAMP production in the mouse pubic symphysis (a classic model of relaxin pharmacology) in a manner that is prevented by previous exposure of relaxin to dithiothreitol or monoclonal antibodies . The effect of relaxin on cAMP production and decidualization in human endometrial stromal cells in vitro is enhanced by concomitant inhibition of specific isoforms of phosphodiesterase . The same authors also demonstrated that progesterone and relaxin alone do not stimulate cAMP production or up-regulate the expression of markers of decidualization (e.g. IGFBP-1 and prolactin). Human endometrial cells exposed to relaxin in the presence of a phosphodiesterase inhibitor produced markedly elevated cAMP levels and up-regulated expression of both IGFBP-1 and prolactin genes whereas progesterone, under the same conditions, produced a very limited increase in cAMP production and up-regulated prolactin gene expression only . Exposure of human endometrial stromal cells and THP-1 monocytes to relaxin also resulted in an elevation of intracellular cAMP that the authors suggested was mediated in part by relaxin mediated tyrosine kinase signaling and inhibition of phosphodiesterase activity . Taken together these results suggest that progesterone and relaxin can synergize to affect significant and sustained increases in intracellular cAMP, an essential part of the decidualization process in primate endometrial cells [83, 103, 104]. Several sensitive control mechanisms exist to regulate relaxin-mediated cAMP accumulation, and thereby implicates cAMP as a prominent mediator of relaxins paracrine effects in the primate endometrium. The interactions between steroid hormones, steroid hormone receptors, steroid hormone response elements and intracellular signaling pathways during decidualization of primate endometrial stromal cells involve a number of very complex features including ligand- and receptor-independent modifications of gene expression and significant cross-talk between signaling pathways [105, 106]. A detailed discussion of the complex steroid-dependent regulation of decidualization is beyond the scope of this review. However, the interactions between progesterone, progesterone receptors and the cAMP-signaling cascade in endometrial stromal cells have recently been expertly reviewed . Based on the information contained in that work it was clearly demonstrated that cAMP-mediated signaling produces a very sensitive regulation of various progesterone response elements (e.g. C/EBPβ, Stat5 and FoxO1a) and subsequent regulation of decidua specific gene expression. The in vitro and in vivo studies cited above and in Table 2 clearly identify relaxin as modulator of cAMP production in the primate endometrium and, by extension, its potential to regulate gene expression during the decidualization process. However, relaxin is only one of many paracrine modulators of cAMP production in the primate endometrium and it remains to be determined whether or not relaxin is a redundant modulator of the decidualization process. Given that relaxin is routinely used in conjunction with E2 and P4 to produce morphologically and biochemically relevant decidualization of primate stromal cells in model systems in vitro [88, 100], it is possible that relaxin is necessary for optimal/clinically relevant decidualization and subsequent placentation in vivo. Following embryo attachment vascularization of the primate embryo is one of the most important events in early pregnancy . Tapping of the maternal vasculature by the embryo is necessary for survival but at the same time exposes the embryo to the full force of the maternal immune system  and to the potential dangers of blood borne component effects on endometrial quiescence . In macaques trophoblastic invasion of the maternal vasculature occurs rapidly (within 2 days of blastocyst attachment) and is marked by syncytiotrophoblast invasion of capillary endometrial cells and cytotrophoblast invasion of superficial arterioles and spiral arteries [110, 111]. Syncytio- and cytotrophoblast cells then work in concert to initiate the villous stage of placenta formation and formalization of feto-maternal circulation . The uterus also exhibits profound changes in vascularization during this period and these changes are mediated by factors of trophoblastic origin . CG acting on LH/CG receptors has been shown to produce many of the characteristic changes in trophoblast cell phenotype and uterine vascularization that are required for embryonic recruitment of the primate maternal circulation . Importantly, CG is able to stimulate the expression of one of the most ubiquitous regulators of angiogenesis, vascular endothelial growth factor (VEGF) . In primates, VEGF expression rises during the secretory phase of the cycle, is prominent in syncytiotrophoblast and decidual vascular endometrium and exhibits positive functional regulation by estrogen and progesterone in a steroid receptor-dependent manner [107, 116–118]. Like CG, relaxin also stimulates the expression of VEGF in endometrial cells in vitro and produces conceptus-like mediated changes of non-human primate maternal vasculature in vivo in the absence of a conceptus [112, 119]. Formation and maintenance of the vascularized corpus luteum, like the formation and maintenance of the vascularized and receptive endometrium, is also dependent upon angiogenesis and is driven by expression of VEGF and other angiogenic factors such as the angiopoetins [120, 121]. In primates, LH and CG appear to be potent regulators of ovarian VEGF expression and promote the vascularization and stabilization of the functional steroid producing corpus luteum [122, 123]. As demonstrated above (see Table 3) CG is clearly able to increase corpus luteum derived relaxin secretion (e.g. pregnancy) over and above that produced by sequential exposure to estrogen and progesterone in the absence of CG (e.g. non-pregnant cycle). LH and/or CG may initiate corpus luteum angiogenesis through direct actions and maintain angiogenesis through stimulation of local activators of angiogenesis signaling such as relaxin . Whether or not ovarian relaxin acts as a functional regulator of VEGF and angiogenesis within the primate corpus luteum or has endocrine effects on endometrial VEGF expression remains to be determined. Studies detailing a parallel effect of CG on endometrial relaxin secretion similar to that observed in the ovary has not yet been demonstrated in primates. Furthermore, a link between CG and relaxin and functional regulation of VEGF expression in the primate endometrium has not been established. However, given that CG and relaxin both stimulate the expression of VEGF in primate endometrial tissues [114, 119], that relaxin expression within the primate endometrium coincides with elevated serum CG levels  and that relaxin induces changes in vascularization of the primate endometrium in the absence of conceptus-derived CG , it is tempting to speculate that some of the CG-mediated effects on endometrial angiogenesis during implantation in primates could be produced by relaxin. Relaxin may also help to enhance embryonic access to the maternal vasculature through other non-VEGF mediated effects such as reduction of platelet release and aggregation  and subsequent reduction in the release of anti-angiogenic factors such as thrombospondin , reduction of vascular fibrosis mediated by enhanced expression of tissue plasminogen activator [125, 126], enhanced synthesis and secretion of prorenin  and direct vasodilation of the endometrial vasculature [reviewed in, [128, 129]]. In order to initiate and maintain contact with the endometrium and maternal circulation the implanting embryo must avoid stimulation of the maternal immune system. This very unique situation is often referred to as the immunological paradox of pregnancy given the large numbers of immune cells present at the feto-maternal interface, and is highly dependent upon the cytokine microenvironment of the endometrium at the time of implantation [130, 131]. Progesterone is a powerful immunosuppressant  and produces polarization of T-helper (Th) cytokine profiles to the Th2 phenotype at physiologically relevant concentrations . The Th2 phenotype is generally considered necessary for the avoidance of fetal rejection and maintenance of pregnancy . Relaxin also produces biological effects on peripheral blood monocytes that polarize the cytokine profile to the Th1 phenotype, a phenotype that appears at first glance to be inconsistent with a role for relaxin in suppression of a potential maternal immune response against the implanting embryo . Relaxin stimulates the production of interferon-gamma (IFN-γ) and tumor necrosis factor-beta (TNF-β) in peripheral blood monocytes, two cytokines that mediate MHC class II restricted host defenses predominantly through phagocytosis, and are potentially detrimental to implantation and pregnancy [135, 136]. Because the embryo is hemiallogenic it is expected that a relaxin-induced Th1 cytokine profile would be disadvantageous to embryo implantation. However, it should be recognized that the effects of relaxin on peripheral blood mononuclear cells may be advantageous in protecting both the fetus and the mother from opportunistic infection, and that the effects of relaxin on T-lymphocyte mediated cytokine expression at the feto-maternal interface may be quite different to that observed in the general circulation based on the unique hormonal milieu of the pregnant endometrium [108, 133]. Indeed, previous reports have demonstrated elevated levels of INF-γ in pregnant women presenting for voluntary abortion compared to non-pregnant women and suggest that elevated IFN-γ may be necessary for fetal maintenance, possibly through stimulation of macrophage mediated expression of the cytotoxic T-cell suppressor indolamine 2,3-dioxygenase . Further support for a positive role of IFN-γ during implantation comes from studies with knockout mice that exhibit deficits in the IFN-γ signaling cascade and also exhibit deficits in endometrial decidual reactions and fertility . Further studies aimed at describing the effects of relaxin on cytokine expression in primate endometrium will be an important area of investigation relating to relaxin biology in early pregnancy. As described above, relaxin exhibits key attributes of a paracrine regulator of implantation in primates: relaxin secretion increases during the mid-late luteal phase of the non-pregnant cycle and continues to rise throughout the first trimester in early pregnancy , tissue specific production of relaxin is up- or down-regulated in a steroid dependent manner during early and late pregnancy [65, 91, 138, 139] and relaxin signaling modifies steroid-dependent regulation of gene expression within the endometrium, decidua and placenta [98, 139, 140]. However, direct evidence linking relaxin administration to changes in endometrial morphology/function and embryo implantation has long been a matter of speculation. Early histological studies with porcine relaxin demonstrated an apparent increase in endometrial angiogenesis in M. mulatta [141, 142]. Functional studies in the common marmoset indicated that administration of highly purified recombinant human relaxin (rhRLX) during the peri-implantation period precipitated an increase in endometrial thickness (E. Unemori, personal communication). More recent observations in humans undergoing rhRLX treatment for systemic sclerosis unmasked a treatment associated increase in menstrual bleeding in a large proportion of the study subjects [119, 143, 144]. A very elegant series of experiments recently performed in M. mulatta has demonstrated the direct effects of relaxin on uterine weight, lymphocyte and arteriole numbers and steroid hormone receptor expression . Thus rhRLX clearly affects the primate endometrium in a manner consistent with a role as a physiological modulator of embryo implantation and early pregnancy. However, the direct effect of relaxin administration on implantation and pregnancy in primate species remains less well studied. We have recently examined the effects of rhRLX administration during the peri-implantation period using in vitro fertilization and embryo transfer (IVF/ET) in M. fascicularis . Many of the difficulties associated with mating and natural conception in macaques that make the study of implantation and early pregnancy difficult can be circumvented by the use of IVF/ET. Previous studies have shown some success with IVF/ET procedures in M. fascicularis, with implantation rates of 8.3%–12.0% achieved using 1–4 embryos transferred per recipient during natural cycles [147–149]. We investigated implantation and early pregnancy in M. fascicularis during IVF/ET using more recently developed techniques [150–152]. Relaxin or vehicle was infused into recipient monkeys (n = 11 per treatment group) from seven days prior (Day 0) to embryo transfer (Day 7) to 14 days post embryo transfer (Day 21), encompassing the luteal phase and extending into early pregnancy (approximately day 8 to day 29 of the cycle). Recipient monkeys received 4 IVF derived and frozen-thawed embryos (2 per oviduct). 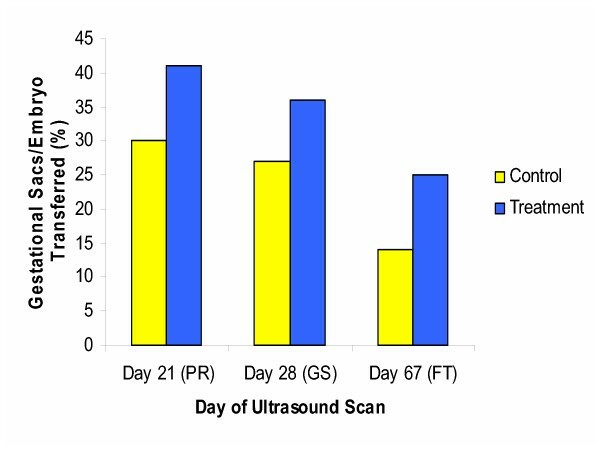 The effect of rhRLX administration on implantation, pregnancy and endometrial thickness were assessed by ultrasound at various time points during drug infusion and up to 46 days after cessation of drug infusion (Day 28 and Day 67) and compared to vehicle treated animals . Recipient menstrual cycles and the quality of thawed IVF derived embryos were not different between the two treatment groups. Recombinant human relaxin produced a transient (Day 7 only) but significant increase in endometrial thickness compared to vehicle (Figure 2). Relaxin also significantly reduced the number of days to the appearance of placental sign (implantation associated bleeding) and significantly increased the total number of bleeding days associated with implantation compared to vehicle (Figure 3). There was a persistent increase in implantation rate in the relaxin group compared to the control group, but this difference did not achieve statistical significance (Figure 4). 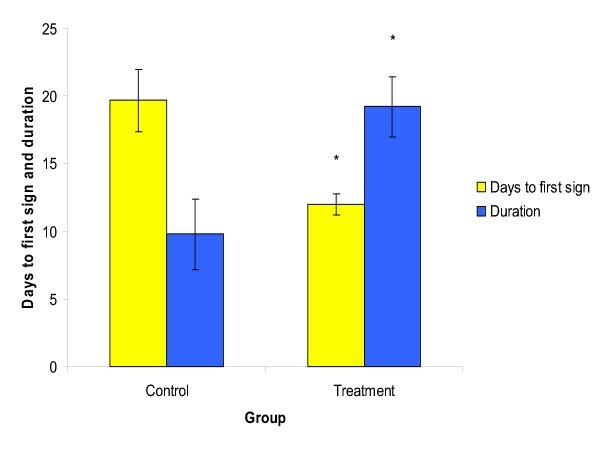 However, sustained multiple pregnancies (twins or triplets) were observed in 60% of pregnant relaxin-treated females compared to 0% in controls (Figure 5). The difference in multiple pregnancy rates was borderline significant (p = 0.06) and was somewhat unexpected given that macaque species exhibit very low rates (0.07%) of multiple gestations in natural and captive breeding environments  and during IVF/ET procedures [147–149] and suggests a possible relaxin-mediated influence. 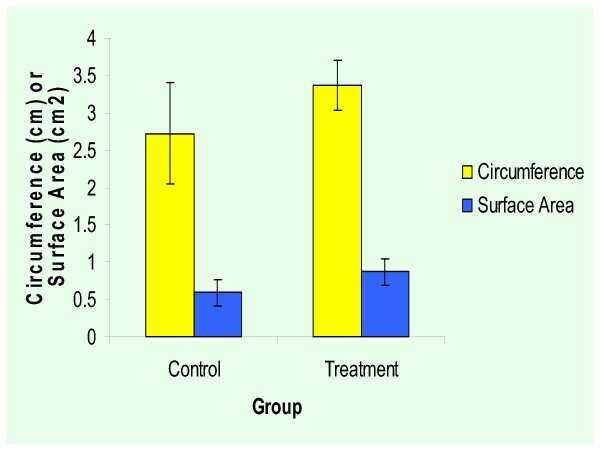 Placental circumference and surface area tended to be larger in relaxin treated pregnancies (Figure 6) but again the effect failed to achieve statistical significance. 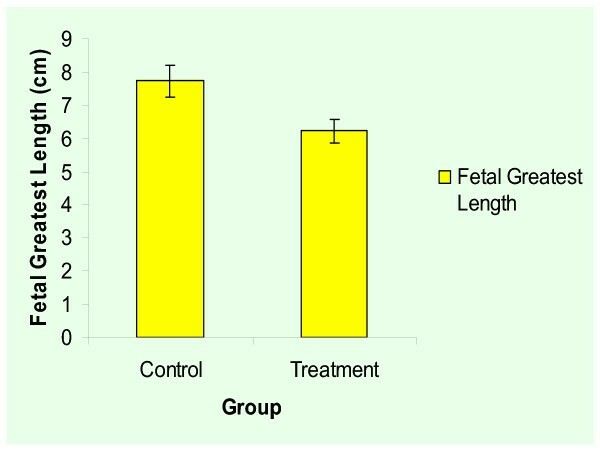 Fetal growth parameters tended to be smaller in relaxin treated pregnancies, possibly as a result of increased numbers of viable fetuses in this group (Figure 7). Effects of recombinant human relaxin on endometrial thickness at embryo transfer (Day 7) in M. fascicularis Illustrates the effects of recombinant human relaxin on endometrial thickness measurements in M. fascicularis at embryo transfer, 7 days into a 21-day treatment regimen. Data are expressed as mean ± SEM (n = 11) for recipient monkeys receiving vehicle (control) and relaxin (treatment). Endometrial thickness measurements were taken in transverse (yellow) and sagital (blue) planes and are expressed in centimeters (cm). 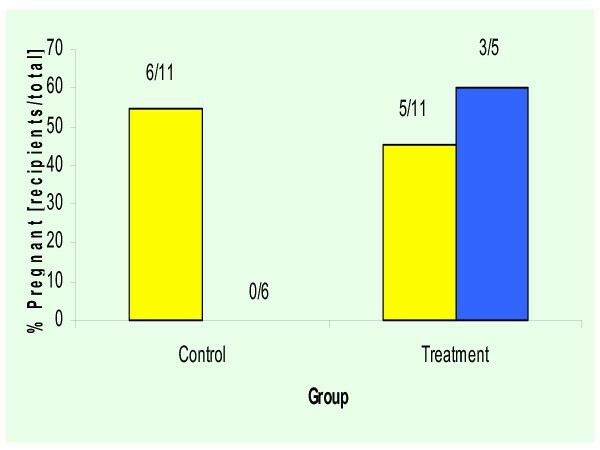 An asterisk (*) indicates a significant treatment related difference compared to control (P < 0.05). Effects of recombinant human relaxin on implantation in M. fascicularis. Shows the effects of recombinant human relaxin on implantation in M. fascicularis at various ultrasound observation time points. Data is expressed as implantation calculated as a percentage of the number of gestational sacs or fetus per embryo transferred (n = 11) in recipient monkeys receiving vehicle (control, yellow) or relaxin (treatment, blue). PR, pump removal; GS, ultrasound scan for gestational sacs; ultrasound can for fetuses. Effects of recombinant human relaxin on pregnancy (Day 67) in M. fascicularis. 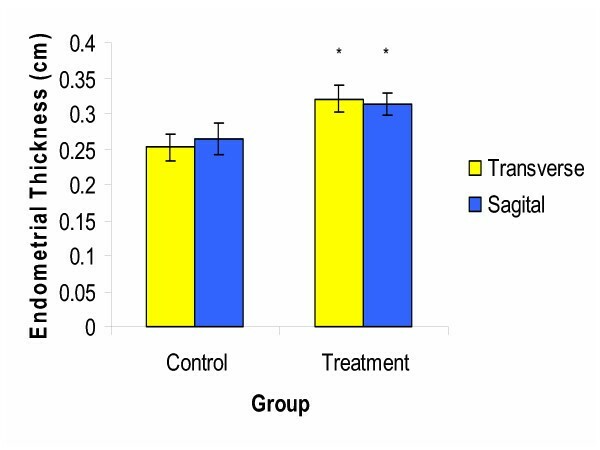 Highlights the effects of recombinant human relaxin on multiple pregnancy rates in recipient monkeys receiving vehicle (control) or relaxin (treatment). The data are expressed as percentages of pregnancies (number/total number of recipients, yellow) and multiple pregnancies (number/number of pregnancies, blue). Numbers above the columns indicate proportions of pregnant animals. Effects of recombinant human relaxin on fetal size (Day 67) in M. fascicularis. Demonstrates the effects of recombinant human relaxin on greatest fetal length in pregnant in M. fascicularis. Data are expressed as mean ± SEM (n = 4–6) for pregnant recipient monkeys receiving vehicle (control) and relaxin (treatment). Fetal length measurements represent crown-rump distances and are expressed in centimeters (cm). Effects of recombinant human relaxin on placental size in M. fascicularis (Day 67). Illustrates the effects of recombinant human relaxin on placental size in pregnant M. fascicularis. Data are expressed as mean ± SEM (n = 3–4) for pregnant recipient monkeys receiving vehicle (control) and relaxin (treatment). Placental sizes were measured as circumference (yellow) and surface area (blue) and are expressed in centimeters (cm) and square centimeters (cm2), respectively. We observed a positive relaxin-mediated effect on endometrial thickness in M. fascicularis. Endometrial thickness increases progressively during a normal human menstrual cycle and remains at and early/mid-luteal phase maximum until one to two days prior to menses . This increase is believed to reflect alterations occurring in the tissue, including an increase in endometrial blood flow [154, 155] and glandular secretory and stromal predecidual changes  that occur under the influence of the steroid hormone milieu. Thus, thickness measurements may be useful as a general descriptive feature of a normally developing endometrium, and, in fact, have been used to identify abnormally thin endometria, which, for whatever reason, have a high implantation failure rate following IVF [157–159]. The relaxin-related increase in thickness may be due to a cellular influence, such as stimulation of predecidualization , or may be the result of increased vascularization, both purported to be effects of relaxin [119, 141]. Our results are in agreement with recent results demonstrating increased uterine weight in rhesus monkeys exposed to exogenous relaxin administration . Relaxin administration in M. fascicularis was also associated with an increased placental sign, or implantation related bleeding. Placental sign is a natural phenomenon that appears several days following mating in pregnant females in some non-human primate species . The bleeding is believed to be associated with the physiology of embryonic implantation in monkeys  and is, contrary to the situation in humans, a positive sign of pregnancy. Relaxin treatment was associated with a significantly shorter time period to first appearance of the placental sign and a significant increase in duration of implantation bleeding, compared to treatment with vehicle alone. A reasonable hypothesis for these increases would be that relaxin has a positive influence on endometrial perfusion, which is known to increase in the luteal phase of the menstrual cycle when relaxin is naturally present . Previous findings, including those cited above, have supported the hypothesis that relaxin affects the uterine vasculature in primates [119, 141, 142, 144, 162]. In vitro, relaxin caused a dose-dependent increase in the secretion of the cytokine, VEGF, in normal human endometrial stromal cells [99, 119]. VEGF stimulates endothelial proliferation and vasodilation, as well as vascular permeability . VEGF and its receptors, which are expressed cyclically in the endometrium [117, 164], may be at least partly responsible for increased blood vessel growth, vasodilation, and vascular permeability that occur in the luteal phase of the menstrual cycle [165–167]. How relaxin interacts with estrogen and progesterone, whose induction of VEGF in the primate endometrium has not been clearly defined , and whether other mediators of angiogenesis are involved remain to be elucidated. Based on the current available body of work with relaxin in non-human primate models of pregnancy several indications for exogenous relaxin use in human assisted reproductive technology (ART) applications become apparent and include amelioration of deficits in endometrial development and vascularization associated with implantation failure, improvement of suboptimal decidual/placental cAMP accumulation associated with abnormal pregnancy and administration combined with single embryo transfer to help promote positive pregnancy outcome while at the same time reducing the risk of multiple gestations. A number of studies have implicated thin endometria as a negative predictor of pregnancy outcome in an IVF/ET setting and experimental evidence in laboratory animals clearly implicates inhibition of angiogenesis with implantation failure [159, 168, 169]. Clinical studies have demonstrated a close negative relationship between poor vascularization of extraembryonic tissues during early pregnancy and viable term delivery [170, 171]. Indeed reduced trophoblastic VEGF expression and decidual VEGF-receptor expression are significantly and negatively correlated with recurrent miscarriage . Supplementation of human IVF/ET cycles with progesterone leads to an increase in endometrial thickness  and progesterone induces up-regulation of angiogenic factors during the secretory phase of the cycle in a manner that is prevented by the PR-antagonist RU486 . However, it is not known if the effects of progesterone on primate endometrial thickness and vascularization involve, or are dependent upon, the presence of relaxin. The fact that relaxin and progesterone synergize to affect full expression of markers of endometrial receptivity  suggests that relaxin may be required to establish optimal implantation conditions. Recent studies in macaques have clearly demonstrated that on a background of steroid hormone priming relaxin produces a direct and significant increase in uterine weight and blood vessel neogenesis . Therefore, administration of exogenous relaxin to subsets of infertile patients presenting with thin and/or undervascularized endometria could potentially improve term IVF/ET pregnancy rates. Mice subjected to lipopolysaccharide (LPS) administration during pregnancy exhibit markedly reduced endometrial cAMP levels and spontaneous abortion marked by fetal expulsion . The LPS mediated effect is enhanced by reduction of β-adrenoceptor-mediated cAMP production and reduced by exogenous administration of dbcAMP or theophylline, a known inducer of cellular cAMP production [174, 175]. These experimental results indicate that maintenance of endometrial cAMP may be a requirement for maintenance of pregnancy. Patients that suffer from recurrent miscarriage exhibit reduced plasma and endometrial concentrations of cAMP [176–178]. Patients with this pregnancy phenotype also exhibit reduced plasma steroid hormone levels and reduced serum levels of hCG . Some groups have suggested the application of hCG or gonadotrophin preparations containing LH for the prevention of recurring or spontaneous pregnancy loss . Although a direct link between hCG, endometrial relaxin secretion and endometrial cAMP production has not been established in primates hCG does prolong the P4 and relaxin producing life span of the corpus luteum , and directly activates cAMP production in cells transfected with the hCG/LH receptor, a receptor that is abundantly expressed in human and non-human primate endometrium during the implantation period [79, 82, 181]. Taken together these results support the use of hCG for treatment of recurrent miscarriage. Whether or not any potential benefits of exogenous LH or hCG treatment against recurrent pregnancy loss are mediated directly by P4, relaxin, cAMP or a combination of these factors is not yet known. Given that relaxin synergizes with P4 and phosphodiesterase inhibitors to potently stimulate and maintain cAMP production in hormonally primed endometrial stromal cells  new therapeutic approaches that employ exogenous P4, relaxin and selective phosphodiesterase inhibitors alone or in combination could reduce spontaneous or habitual pregnancy loss associated with inadequate endometrial cAMP signaling. Recently a number of clinical IVF/ET variables including, but not limited to, patient selection criteria, aggressive superovulation protocols, improvements in embryo culture conditions, improved morphological assessment of developing embryos and hormone supplementation of transfer cycles have led to increases in both singleton pregnancy rates and multiple pregnancy rates resulting from ART procedures [182, 183]. Where steroid hormone profiles can be closely monitored the judicious administration of exogenous relaxin combined with transfer of a limited number (n = 1?) of good quality embryos could potentially enhance pregnancy rates and, at the same time, limit the number of multiple pregnancies. Given that high levels of circulating relaxin are not needed for initiation and maintenance of pregnancy in primates it may be possible to achieve the desired outcome of singleton pregnancy with relaxin administration at the time of embryo transfer only. Because relaxin can produce disparate effects on reproductive physiology depending upon the underlying steroid hormone milieu [55, 89, 99] and because relaxin may be responsible for aggravation of tumor growth and invasiveness under certain conditions [184, 185], any potential applications of exogenous relaxin in human ART procedures may require further mechanistic, efficacy and safety studies in clinically relevant non-human primate species. As is often the case in reproductive biology the stage is set and directed by the steroid hormones and gonadotrophins with bit parts played by paracrine/autocrine actors that may or may not be redundant. Primate relaxin is clearly paracrine modulator of reproductive physiology related to pregnancy whose redundancy has not yet been established. Primate ovarian relaxin is not required for initiation or maintenance of pregnancy provided adequate levels of steroid hormones are developed and maintained. However, primate relaxin is also produced by both fetal and maternal sources within the pregnant endometrium and directly or indirectly activates a number of cellular signaling systems that are crucial to initiation and maintenance of pregnancy and proper term delivery. Administration of human relaxin to cycling female monkeys during the peri-implantation period resulted in a transient increase in endometrial thickness and increased implantation-related bleeding and are consistent with other studies in non-human primates demonstrating a positive role for relaxin in modulating endometrial physiology during the implantation period. Whether or not primate relaxin is necessary for successful pregnancy remains to be determined. Key relaxin ablation experiments and/or application of selective relaxin receptor agonists and antagonists in model systems will be required to expand our understanding of the nature of relaxin in primate pregnancy. Pharmacological manipulation of the endometrium with exogenous relaxin could be of value in human ART procedures where inadequate endometrial development and vascularization have a negative impact on pregnancy rates, where dysregulation of cAMP production and metabolism are associated with pregnancy disorders and where a reduction in multiple pregnancy rates associated with ART procedures is warranted. The recent discovery of functional relaxin receptors offers the promise of further identification of specific relaxin targets within reproductive tissues, as well as the design and development of potent and selective synthetic relaxin agonists and antagonists with which to perform functional studies. The use of these tools in non-human primate models should accelerate the elucidation of relaxin's specific role(s) in pregnancy and any potential applications for relaxin in human ART. The studies with recombinant human relaxin conducted in M. fascicularis were funded by Connetics Corp, Palo Alto, CA, USA. The studies were designed by EU and executed by EH. The data presented here has previously been disseminated in abstract (International Embryo Transfer Society Annual Meeting, Auckland, New Zealand, January 2003) and oral (International Embryo Transfer Society Annual Meeting, Post Conference Symposium, Portland, OR USA, January 2004) forms. The full details of our work with M. fascicularis have been submitted for publication elsewhere. Eliza Curnow was responsible for all of the IVF/ET procedures in M. fascicularis and is thanked for her expertise in the field of non-human primate ART. Alan Trounson also contributed to the study of relaxin administration during IVF/ET in M. fascicularis and his input is greatly appreciated.